The Yard Series is a series of experimental brews available only at the Anchor Beer Garden by the bay in San Francisco. Currently on tap, you can try any or all of these one-off beers for a limited time. A Pale Ale brewed with 100% 2-row pale malt and Cascade hops in the brewkettle, generously dry-hopped with Nelson Sauvin in the cellar during secondary fermentation. We used Anchor’s in-house ale yeast strain. It is an easy drinking beer with plenty of complexity and fruity, wine like hop aromas. This sessionable IPA is brewed with 100% 2-row pale malt for a bright, golden color. We hopped it liberally with Nelson Sauvin in the brewkettle and then dry-hopped with a blend of Cascade, El Dorado & the Haas Experimental Hop No. 431 in the cellar. The result is a nice crisp IPA that is bursting with lush tropical & citrus hop aromas. Delicious! An unfiltered Triple IPA abundantly dry-hopped at 3 lbs. of hops per barrel of beer, using Citra, Calypso & Eureka! This is an unapologetic and delicious expression of hop flavor and aroma. 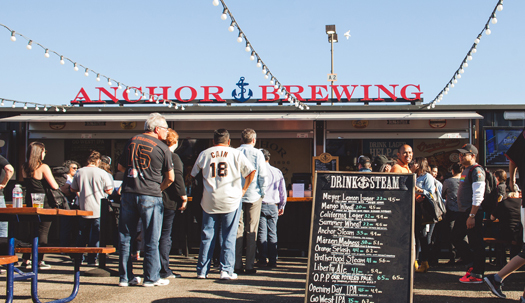 The Anchor Beer Garden on the bay offers a uniquely San Francisco experience with Anchor brews & local grub and a lively calendar of social events. We’re a family and dog-friendly space open every day for lunch, dinner or simply for enjoying a few pints with friends. Serving as an extension of the Anchor Brewing Taproom, we sell a variety of Anchor apparel plus growlers and 6-packs to go. With four big TVs it’s the perfect outdoor destination for watching your favorite sports team. 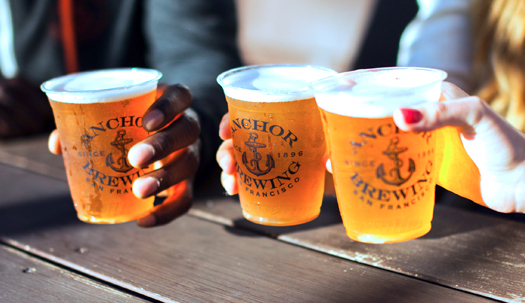 Exclusive Anchor Beer Garden brews are available by the pint, flight, or pitcher. For more information visit www.anchorbrewing.com/beergarden.